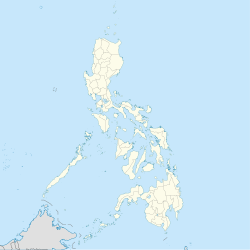 Datu Montawal, officially the Municipality of Datu Montawal, is a 5th class municipality in the province of Maguindanao, Philippines. According to the 2015 census, it has a population of 34,820 people. The municipality, then known as Pagagawan, was created under Muslim Mindanao Autonomy Act No. 95 on July 18, 2000, carved out of the municipality of Pagalungan. It was renamed to Datu Montawal under Muslim Mindanao Autonomy Act No. 152 on June 9, 2003. Datu Montawal is politically subdivided into 11 barangays. ^ "Muslim Mindanao Autonomy Act No. 95; An Act Creating the Municipality of Pagagawan in the Province of Maguindanao, and for Other Purposes" (PDF). Regional Legislative Assembly, Autonomous Region in Muslim Mindanao. Retrieved 27 January 2016. ^ "Muslim Mindanao Autonomy Act No. 152; An Act Changing the Name of Pagagawan in the Province of Maguindanao to Municipality of Datu Montawal" (PDF). Regional Legislative Assembly, Autonomous Region in Muslim Mindanao. Retrieved 27 January 2016. ^ "Datu Montawal, Maguindanao : Average Temperatures and Rainfall". Meteoblue. Retrieved 19 January 2019.